LYNCHBURG, Virginia, April 30, 2014 (ENS) – A CSX train carrying crude oil derailed in downtown Lynchburg today, bursting into flames and sending a column of dense black smoke high into the afternoon sky. Oil spilled into the James River and some 350 people were forced to evacuate the downtown area of Lynchburg, a city of 75,568 located in the foothills of the Blue Ridge Mountains along the banks of the James River. There have been no reported injuries. Company officials report that 15 CSX tanker cars carrying crude oil were involved in the derailment. Three of the cars caught fire and tumbled down an embankment into the river. CSX says the company has been advised by fire officials that the fire has been extinguished. Three cars were still leaking oil into the river Wednesday evening, according to Lynchburg Mayor Michael Gillette. CSX crews are working to remove the portion of the train that is blocking workers from leaving Griffin Pipe Foundry located in the lower basin. CSX said in a statement that the train was traveling from Chicago to Virginia when the derailment occurred. The company is has emergency response personnel, safety and environmental experts, community support teams and other resources on-site and on the way. “We are committed to fully supporting the emergency responders and other agencies, meeting the needs of the community and protecting the environment,” CSX said in a statement. The company has opened a community outreach center at the Wingate Hotel, 3777 Candlers Mountain Road to handle community needs arising from the derailment. The cause of the derailment has not been determined at this time. National Transportation Safety Board investigators are already at the site. The U.S. Department of Transportation said it was sending Federal Railroad Administration inspectors to Lynchburg, and the U.S. Environmental Protection Agency said an official will soon be there to help the state monitor air quality. Effective immediately and continuing for an unknown length of time, a section of the James River Heritage Trail known as Riverwalk will be closed between Jefferson Street and Amherst County including Jefferson Street, and Percival’s Island Natural Area and parking lot. 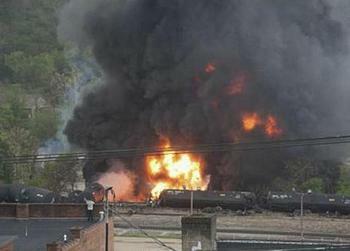 The Lynchburg incident is the latest in a lengthening string of oil train disasters. Crude oil and ethanol transportation by rail has seen phenomenal growth in North America over the last decade, altering the way these flammable liquids are transported, the National Transportation Safety Board said last week in a two-day conference on improving the safety of transporting these fuels by rail. “While the soaring volumes of crude oil and ethanol traveling by rail has been good for business, there is a corresponding obligation to protect our communities and our environment,” said NTSB Chairman Deborah A.P. Hersman. Trains made up predominately, if not entirely, of crude oil and ethanol cars, consisting of DOT-111 general-purpose tank cars and many thousands of barrels of liquid, have become increasingly common, she said. “The amount of crude oil being transported exceeds emergency response capabilities,” Rick Edinger told the NTSB conference. Edinger ought to know. He serves as Executive Fire Officer and Assistant Chief of the Chesterfield County Fire and EMS Department and vice-chair of the International Association of Fire Chiefs Hazardous Material Committee. A number of rail accidents, both in the United States and Canada, involving dedicated trains or large blocks of flammable liquid tank cars, have demonstrated the vulnerabilities of the DOT-111 tank car and the need for comprehensive risk mitigation and emergency response strategies, Hersman said. Up to 80 percent of the Canadian fleet, and 69 percent of U.S. rail tank cars are DOT-111 type. Hydraulic fracturing of new wells in the shale oil fields of North America has rapidly increased use of DOT-111 cars to transport crude oil to existing refineries along the coasts, with a corresponding increase in accidents. In July 2013, the Montreal, Maine and Atlantic Railway runaway train that derailed in the Quebec town of Lac-Mégantic was made up of 72 of these DOT-111 cars. Some of them ruptured, releasing their cargo of Bakken formation light crude oil, which exploded causing 47 deaths and destroying much of the town. Last November, a 90-car train carrying crude oil derailed and exploded in a rural area of western Alabama, leaving 11 cars burning. More than 476,000 gallons of crude oil were released in the December 30, 2013 accident, and the massive fire triggered a voluntary evacuation of 1,400 people from the surrounding area and resulted in millions of dollars in damage, she said. North Dakota is particularly vulnerable to oil train disasters as the oil-bearing Bakken formation underlies parts of North Dakota, as well as Montana, and the Canadian provinces of Saskatchewan and Manitoba. “Not only is more crude oil being transported by rail but some of the crude oil being moved on the nation’s railroad system – such as that originating in the Bakken formation – may have more volatile properties,” Hersman told the senators. Also, ethanol traffic by rail increased 442 percent between 2005 and 2010. In 2012, ethanol was the most frequently transported hazardous material in the railroad system, Hersman told the subcommittee. Copyright Environment News Service (ENS) 2014. All rights reserved.